May–Thurner syndrome (MTS) usually presents as acute or chronic deep vein thrombosis (DVT) in patients. 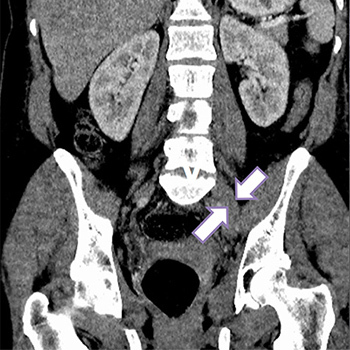 A 49-year-old woman presented with left lower limb DVT, which was followed by a diagnosis of MTS on a background of polycystic ovary syndrome (PCOS) and hypothyroidism. MTS is more common among women in the second to fourth decades of life. An endovascular approach is the preferred first-line treatment for MTS. Kalu S, Shah P, Natarajan A, Nwankwo N, Mustafa U, Hussain N. May-Thurner syndrome: a case report and review of the literature. Hindawi 2013;2013:740182. Di Folca A, Pesavento R, et al. Deep vein thrombosis care pathway - the SIAPAV model. Guidelines of the European Society for Vascular Medicine. Available from http://vascular-medicine.org/wp-content/uploads/2017/05/SIAPAV_DVT_CP_model_ver01_def_20170306.pdf. Xueqiang Zhang, Xiuhua Shi, Pingrui Gao, Junbo Wang, Shusen Li, Shuge Yao, et al. Endovascular management of May-Thurner syndrome: a case report. Medicine 2016;95e2541. Rajachandran M, Schainfeld RM. Diagnosis and treatment of May-Thurner syndrome. Vascular Disease Management 2014;11:265-273. Duran C, Rohatgi S, Wake N, Rybicki FJ, Steigner M. May-Thurner syndrome: a case report. Euroasian J Med 2011;43:129–131.